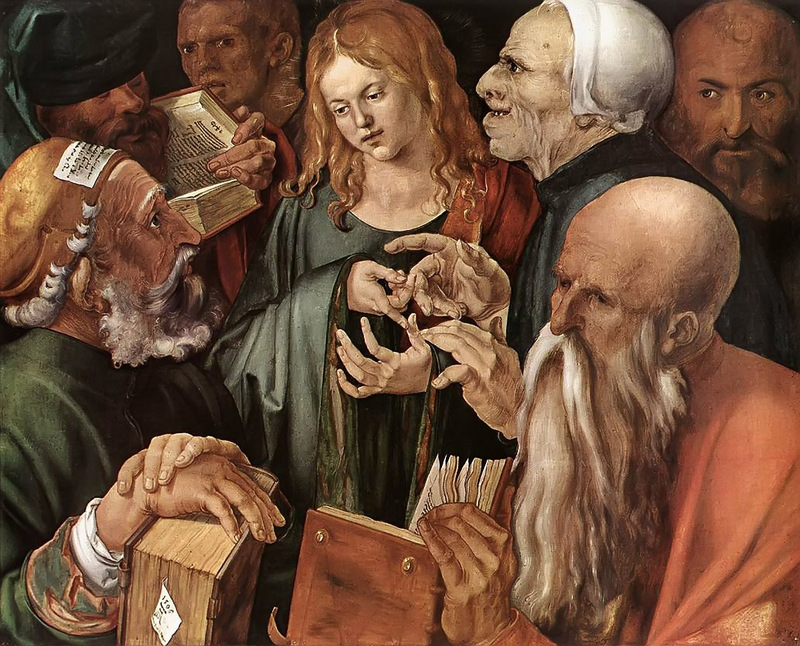 Christ among the Doctors is an oil painting by Albrecht Dürer, dating to 1506, now in the Museo Thyssen-Bornemisza, Madrid,Spain. The work dates to Dürer's sojourn in Venice, and was executed (according to the inscription Opus Quinque Dierum, meaning "Made in five days") hastily while he was working at the Feast of the Rosary altarpiece. According to some sources, it could have been gifted to painter Giovanni Bellini. In the latter's house it was perhaps seen byLorenzo Lotto, who used one of the figures in the painting for his Madonna with Child between Sts. Flavian and Onuphrius now in theBorghese Gallery. The subject had been already treated by Dürer in a woodcut of the Life of the Virgin series and in a panel of theSeven Sorrows Polyptych. However, in the Venetian work the German artist adopted a totally new composition, with the characters occupying the whole scene and surrounding the young Jesus, leaving a little room for the black background. The character at the left of Jesus is a true caricature, perhaps inspired by one of Leonardo da Vinci's drawings seen by Dürer. The man in the lower right corner has a cartouche on his beret, a custom of the Pharisees. The one on the opposite side is perhaps a citation of Bellini.